Welcome to Part 3 of "21 Tips for Great Writing." Just to do a quick summary, in Part 1, I discussed some basic bullet points that are key to quality writing, such as being relevant, writing for your audience, getting a good flow going, and being mindful of punctuation. Part 2 highlighted some additional areas most of us might not think about, such as presenting your point of view, varying your sentence length, creating a sense of immediacy with your writing, and breaking up your text with bullets, subheads, and other techniques. So here are my final tips #15-21, and since I want to follow my own advice and exit with a bang, make sure you read until the end to find out how you can get a literary treat. 15. Let Your Voice Find You. This can be easier said than done, but once you get it, you'll know it. What is your writing voice, exactly? It's your personality on paper, and what sets you apart from everyone else and also makes you human. Many beginning writers are confused about voice, and don't know how to find it. Often, that's because it's so obvious, they can't see it. Think about the way you talk to a friend, or how you write in your journal if you have one, or how you write letters. Maybe your voice is best reflected in how you tweet, or write a list or photo caption. Don't try too hard, it's a subtle thing. 16. Make Your Case -- Be Factual if you Need to Be. With business writing in particular, such as white papers, reports, fact sheets, and press releases, you need to support any general statements, statistics, and suppositions, with facts, or you will lose credibility as a writer. Support your claims with a combination of online and hard copy resources that are relevant and appropriate for your topics, and cite them in the appropriate format as well. The Chicago Manual of Style is a great resource for how to format citations, references, and other third-party material. The point of blogging, or writing a white paper, report, or article, is to demonstrate your expertise on a given topic or area. Sure, it's OK to admit you don't know everything about a topic, or that you have questions about it, or even that you've changed how you feel about it. But you should have a passion for it, and a unique point of view that sets you apart. All this will show in your writing. Storytelling is one of the oldest techniques there is to get your point across. Ironically, with the advent of video, blogging, social media, and today's communication tools, it is now one of the newest techniques as well. Videos go viral over how well they tell their story, and people can become social media heroes if they pack a punch in 140 characters. Have you ever noticed that almost every public speaker or presenter starts out by telling a story to the audience? That's because it's a great way to be transparent with them -- to share something about themselves that the audience can identify with, or be moved by. And while you're at it, don't be afraid to be funny. People love to laugh and particularly in fiction, eveyone loves a funny narrator. 19. Be Positive and Use "Up" Words. I was recently editing a video script a client had written, and was consistently irked by a phrase he kept using, not only in the script, but throughout his web site and all through his information products! I couldn't quite put my finger on it, until in the middle of the night (OK, I was working at 3 am), I realized what it was. His key tagline was in the form of a negative. It's nearly impossible to get your mind around a negative. It's hard to say, hard to envision, and is just plain confusing. Say what something is, rather than what it isn't. Instead of writing, " not expensive," write "economical." Instead of writing "painless," (which still evokes the word pain), say comfortable. Try it, you'll like it. Get it? 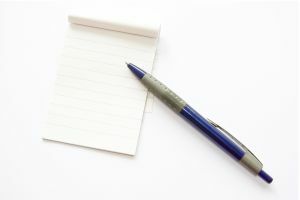 I once took a writing workshop where we had to list an idea we had at the top of the page, and then underneath it, list at least 10 ways to show the idea. What the teacher was trying to illustrate was that we should not necessarily use the first example, character, situation, or detail, that comes to mind. The class was 10 years ago, and I still remember the lessons I learned from it today. Allow yourself the freedom of multiple choice. For example, suppose your are trying to show that your character is nervous about something, and you decide she is going to bite her nails to illustrate this. But maybe she might also twist the ends of her hair. Or, maybe she might overeat, or start calling people on the phone. Maybe it ends up being one of these, or all of these, but think it through. Often we go to readings or lectures and are impressed by how fluid the speaker is. We might say, "it sounds so natural, like it just flowed." What we don't realize is that the behind-the-scenes effort in making great writing sound and read effortlessly, can be extensive. I once read that a blogger should spend at least 2 hours on each post. I'm not sure that this is always the case, but remember that whatever you write, you should always revise, even if it's just to tweak a sentence or move a paragraph. No one writes perfectly the first time. Some even say that writing is revising, so don't be afraid to jump in a change your rough draft. It's also a good idea to get a little distance from what you've written. Take an hour, or a day, or a week away from your piece, and then come back to it. That's also an argument for optional tip #22 -- make sure you allow yourself enough time in advance of your deadline, so that you have time for revisions! Congratulations, and thanks for reading my "21 Tips for Great Writing." And now it's time to reward your enthusiasm. 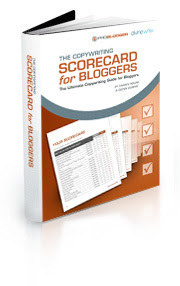 Just post a comment here or over on my FAN page as to which tip resonates with you the most and why, and you will receive a digital copy of my favorite new resource, Copywriting Scorecard for Bloggers, by Darren Rowse of Problogger fame. A $30 value. Promotion ends Friday, October 8.